Pop up cube calendars can be a creative and innovative gift for your clients. Apart from looking stylish, the pop-up cube calendars are an important accessory for your everyday needs. These calendars are a novel way of creating a lasting impression on your clients. The stylish pop-up cube calendar do not occupy much space but at the same time makes your desk look elegant. 3 months each are printed on the 4 sides of the calendar and 2 of the sides contain design elements. You do not have to flip through pages to mark the calendar, just rotate it to go to the relevant date. The pop-up cube calendars are a creative way to market your own brand as well by adding the logo of your company to the design. The pop-up cube calendar are a creative desktop display idea. You can also personalize the pop-up cube calendar design to add a personal touch to make your clients feel important. With PrintStop, it is easy to upload your calendar designs or select from our range of online pop-up cube templates to select a suitable design. A calendar is a calendar. But even calendars can look classy and attractive, even they can have types! There is a wall calendar, a desk calendar, and then comes the pop-up cube calendar. While you know what you are going to get, but getting an insanely good calendar is something else! Especially if you are into marketing and have an awesome budget to spend. A 3 dimensional way to keep up to all your meetings and appointments is a good decision. It not only promotes your business and brand name, but also showcases professionalism with a classy attitude! Not only that, they can also be customised based on your business needs and specifications. PrintStop is known to design custom printed pop-up cube calendars online and delivering it to your doorstep. Our services cater to all the small and big business enterprises. PrintStop's custom printed calendars go hand in hand with all the corporate affairs. Our personalised pop-up cube calendars offer year round publicity and extreme brand exposure to your business. Order them from us and use them as give aways at public affairs and events, that too without splurging beyond your capacity a lot. PrintStop's cube calendars can be customised according to your needs. Our pop-up cube calendars have ample of space to include your brand logo with some business products along with a message. In fact, discount coupons can also be included to take your promotions a step further! You can come up with a different sector for each pop-up page of the calendar to showcase maximum information about your business. Customised calendars are a perfect way to connect to your clients and employees. You can send them as gifts or sell them as an individual promotional item! Both ways, it is you and your business that benefits. These calendars are so attractive tat they can be kept at desks as decorative show pieces. 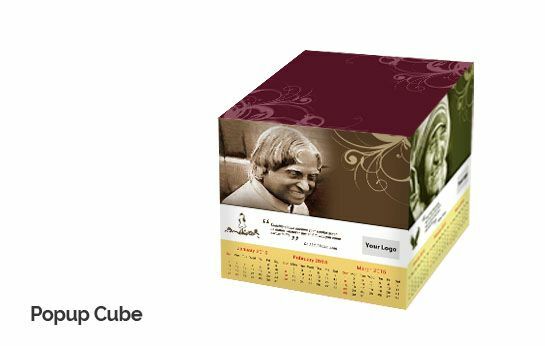 Your customers will remember you whenever they see this exceptional cube calendar, as it is catchy and turns heads! It results in repeat purchase from the same customers. This one time investment will help you market your brand for a whole year! You can either upload your own design or get it custom made through us. If you want a custom design for a pop-up cube calendar, then you can visit our DESIGN page and get a professional design from our creative team Pehchaan! 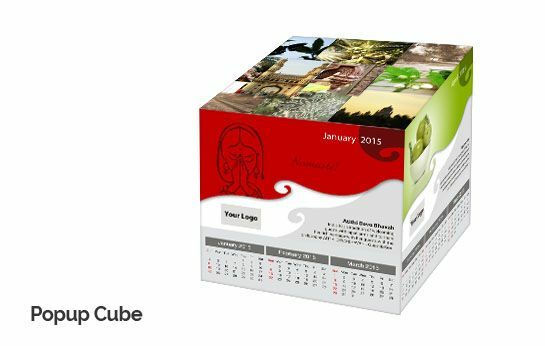 We will design and print a customised pop-up cube calendar for you. To order online from us, visit our website today!